Pursuant to the Federal Electronic Reporting Rule, electronic submission of NJPDES monitoring report forms is now required for reporting periods beginning January 1, 2017. 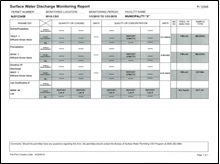 Monitoring Report Forms (MRFs) consist of three form types: Discharge Monitoring Report (DMR) forms, Residual Transfer Report (RTR) forms, and Waste Characterization Report (WCR) forms. MRFs are used for the routine reporting of influent and effluent monitoring data for NJPDES Discharge to Surface Water (DSW), Discharge of Storm Water (DST), Significant Indirect User (SIU), and Discharge to Ground Water (DGW) permits. MRFs are also used for the routine reporting of residuals quality and quantity data as required by the Sludge Quality Assurance Regulations (N.J.A.C. 7:14C) as well as for submitting compliance monitoring data for NJPDES/Residuals permits. The Department has adopted policies to conduct business electronically without the need for paper, including submission of MRFs. Additionally, new and existing State regulations now require electronic submission of MRFs and other reporting information. Starting December 21, 2016, DSW/DST permittees must submit DMRs electronically consistent with the provisions of 40 CFR 127 (i.e. also known as the NPDES Electronic Reporting Rule). After this date, paper DMR forms will no longer be mailed to DSW/DST permittees; nor be accepted by the Department. Electronic submission of MRFs has been offered by the Department since April 2003. This service is available through the Department’s Online Portal - NJDEP Online. There are numerous benefits to the electronic submission of MRFs including, but not limited to, electronic acknowledgement of submitted forms, identification of data entry errors before submission, accessibility to archived forms, errorless transmission of submitted data and no postage fees. If you have any questions regarding electronic submission of MRFs, please contact the Permit Administration Section at (609) 984-4428 or send us an email at NJPDES_EDI_SIGNUP@dep.nj.gov. Provided below are various informational documents and videos regarding the registration for, and use of, the MRF submission service. Permittees are encouraged to review this material prior to beginning the electronic submission service registration process. Please click here for a quick summary on the steps involved with registration for the MRF electronic submission service.